The Sundarbans, as the world’s largest mangrove forest, is home to more than 300 species of plants, 200 species of fish, 315 species of birds and 49 species of mammals. And soon, the World Heritage site will sit just over eight miles south from two huge coal plants — planned developments that many worry will damage the air and water quality of the forest and destroy the livelihoods of the thousands in Bangladesh and India. If environmental and human rights protesters have anything to do with it, however, that won’t happen. Last week, hundreds of activists marched more than 150 miles from the Bangladeshi capital of Dhaka to the southwestern Bagerhat District, a four-day protest that ended over the weekend. The protesters called on the government to halt plans for the 1,320-megawatt Rampal coal plant and the 565-megawatt Orion coal plant, both planned for Bangladesh. The larger Rampal plant, which would take up more than 1,800 acres of land, is scheduled to go online in 2021. The protesters were also calling on the government to conduct an independent Environmental Impact Assessment (EIA) of the coal plants, said Sharif Jamil, coordinator of Waterkeepers Bangladesh. The Bangladeshi government did conduct an EIA on the Rampal power plant, but it used the Center for Environmental and Geographic Information Services, a government-run agency, to do so. Since the Rampal plant is a joint project of India’s state-owned National Thermal Power Corporation and Bangladesh’s Power Development Board, getting a government agency to conduct the EIA “raises questions on the objectivity of the report,” a study on the coal plants by South Asians for Human Rights states. “We hope the governments will understand the importance of the Sundarbans and will cancel the permits, and we demand [the] government to ensure independent investigation by the EIA before any such plant be declared,” Jamil said. Environmentalists’ worries about the power plants are multi-faceted. They’re concerned about the construction phase of the plants, which could lead to “severe damages to the ecosystem…due to excessive carriers on the rivers, clearing of forests, leaked oil, sound and light pollution, [and] disposal of waste and for dredging of the rivers,” as outlined in the report by South Asians for Human Rights. Once the plants are completed, the government’s Environmental Impact Assessment estimates they will put out 142 metric tons of sulfur dioxide and 85 metric tons of nitrogen dioxide per day — pollution that would damage the air of the Sundarbans, Jamil said. The coal plants “have a huge potential to do harm to the wildlife and unique biodiversity of the Sundarbans,” he said. We hope the governments will understand the importance of the Sundarbans and will cancel the permits Water pollution is also a major concern. The Rampal power plant would take 219,600 cubic meters of water from the Passur River,upstream from the Sundarbans, every day for its operations. The coal plant’s activities could end up changing the river’s salinity and temperature, said Neha Mathew, associate campaign representative with the Sierra Club. That change in salinity and temperature could be dangerous for the mangroves that depend on the river. In addition, the area’s rivers will be used to ship coal to the plant, causing concerns of a spill. Environmentalists are acutely aware of the potential of a fossil fuel spill in the Sundarbans: in December 2014, an oil tanker spilled92,000 gallons of oil into the Sundarbans’ Shela River. The Sundarbans support the livelihoods of several million people. The mangrove forest serves as a nursery for baby fish, mollusks, and crustaceans, who hide out and feed among the trees’ branching roots. They also effectively protect Bangladesh and India’s shorelines from storm surges and flooding: two things that could get worse as climate change progresses. Even without the threat of the coal plant — whose emissions will contribute to climate change — sea level rise isthreatening to submerge the Sundarbans. 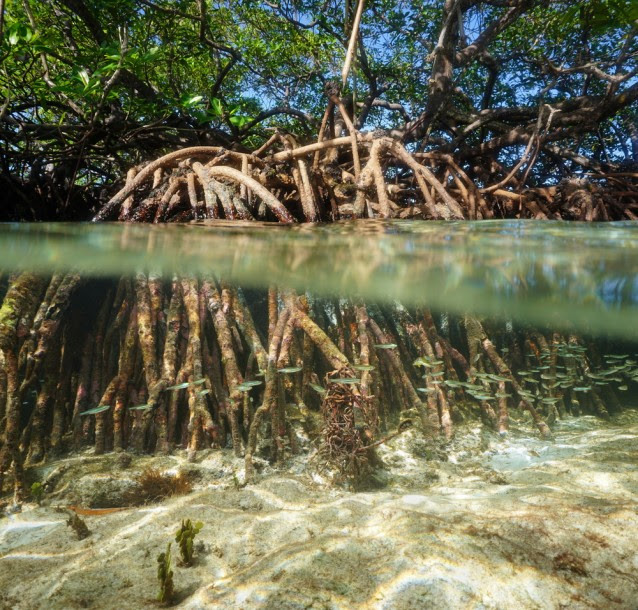 Fish swim among mangrove roots. The Indian and Bangledeshi governments maintain that the project wouldn’t harm the region. “We see no reason why this project would destroy the Sundarbans, as alleged,” Ujjwal Bhattacharya, managing director of the Bangladesh-India Friendship Power Company (BIFPC), told the Guardian. Environmentalists are hoping to capitalize on these setbacks and convince the two governments to abandon the plan.